Weeds can ruin the overall appearance of your garden, particularly your flower beds. So, what you need to do is to learn how to control weeds in flower beds to achieve a well-groomed and manicured garden that adds to your property’s appeal. The tips below can help you maintain your garden’s beauty while minimizing the amount of time you spend weeding regularly. 1. Dormant weeds are better left untouched. While weeds are generally pulled at the roots, it is advisable to just leave alone any dormant or “sleeping” weeds including the soil. Keep in mind that there are weed seeds in about every square inch of your flower bed. However, only the seeds found at least one to two inches at the top of the soil grow once the germination process occurs after receiving sunlight. When you dig the soil, this causes weed seeds underneath to go up the surface and erupt eventually after you cultivate a patch of land. With this in mind, digging should be done only when necessary, and be sure to cover the disturbed area with mulch. Another thing you can do is to sever the feed source of lawn weeds with a knife, as this reduces soil disturbance without having to dig out the weeds. Once weeds seeds are dormant, you no longer have to worry about them infesting your lawn unless disturbed. 2. Mulching stops weeds from growing. Since weed seeds tend to germinate after they receive a good amount of light, you may want to consider mulching to cover weeds and prevent them from growing. Materials you can use for mulching include bark nuggets, pine needles, straw or wood chips, to name a few. Aside from preventing weeds from growing, mulch maintains the cool temperature of soil. It also enhances the soil’s fertility while preventing light from shining through weed seeds. You may even want to use organic materials for mulches that help carabid beetles and crickets eliminate weed seeds. It is important to note that there may be instances when you will notice light passing through the mulches. To make things worse, it may even be laced with a bunch of weed seeds. Hence, make it a point to replenish the mulch to maintain the 2-inch depth level since going deeper than this can deplete the oxygen in soil. You may also want to cover the surface of the soil with a biodegradable fabric, newspaper or sheet of cardboard before spreading a good amount of mulch on top of it. In case you have areas in the lawn that is not dug often, specifically root zones of trees and shrubs, you may consider using good quality landscape fabric for the bottom sheet blocking the light. However, there may be instances when weed seeds are blown by the wind or dropped by birds, which may soon grow when there is sufficient organic matter on the fabric. To have an effective bottom layer of the fabric, be sure to pull away these seeds to prevent them from sinking into the ground. 3. Determine the best weeding condition. When the ground is wet, this is the perfect time to start weeding. Gather the right tools you will needs such as your gloves, trug, table fork and sitting pad. A good old table fork is just what you need for twisting out chickweed or henbit, but a fishtail weeder is better used for prying up dock or dandelion weeds. Once the soil is dry, weeds that you cut off below the soil line die quickly. This is particularly true when you use a hoe that comes with a sharp edge. As for weeding in mulched flower beds, an old knife would suffice for severing weeds to their roots. Afterwards, patch the dug area with a plant to prevent weed seeds from germinating further. 4. Just remove the top portion of the weeds. If it takes too much of your energy to remove weeds from their roots, you can simply chop off the weeds’ heads. Cutting tops of bindweed, as well as other perennial weeds, minimizes chances of reseeding, and it also limits the spread as the supply of food reserves and root buds is used up. When cutting the heads of weeds, pruning loppers or string trimmers may be used. If you use the latter, be sure this tool has a blade attachment that can be effective enough to trim brambles and prickly thistles up to the nubs. Chopping weeds right before they start to seeds prevents spreading, which also saves you from frequent weeding. 5. Avoid having some room between plants for weeds to grow. Flower beds should have little spaces for weeds. The best way to do this is by having close spacing between plants through mass plantings. You may also try shaving off at least 25 percent from the spacing typically required when planting. However, proper spacing is still important since it prevents adjoining plants from touching and crowding once they have reached maturity. So, to keep your plants healthy and eliminate risks of foliage diseases among plants that are prone to these conditions, spacing recommendations should be followed. 6. Avoid watering weeds by performing drip irrigation. You may either water your plants by hand or opt for drip irrigation, which are effective ways of preventing water from getting into weeds. For drip irrigation, simply put a soaker or drip hoses underneath mulch, and this irrigates your plants while leaving out weeds. This technique can minimize the possibility of germinating weed seeds by up to 70 percent. In case you decide to use drip irrigation, nutsedge and bindweed might grow quicker due to this technique since these perennial weeds are deeply-rooted into the soil. So, watch out for these weeds when you use drip hoses in watering your plants. These are only some of the different strategies worth considering when you want to minimize weeding in your flower bed. Additionally, you may want to enrich the soil with a good amount of organic matter as this reduces the chances of weed seeds to germinate. 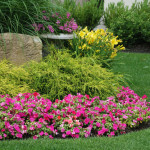 By applying these tips, you can keep your flower bed neat and attractive without any unsightly weeds ruining the look.